Parsley, How do I love thee??? Lets' count some ways... You're high in iron, you garnish well, you're a great breath cleaner, and you attract some of our favorite butterflies- swallowtails! Parsley, like most other dark green herbs, gathers nutrients from the ground, uses it's chlorophyll to convert sunlight to energy, and leaves behind a lot of nutrients ( and taste) for us! You can (and should) use parsley as a garnish when offering a red-meat meal (or anything 'heavy') because the chlorophyll can freshen your breath and make digestion easier. Parsley is often used as 'bitter herbs' in Passover meals, but don't let that scare you away. In small amounts it can add a great flavor to your dishes, both on the stove & baked. If you're really brave, chop some finely and add it to your salad! Parsley is a biennial, meaning it takes 2 years to complete its life cycle. The first year it grows luscious leaves, the second year it grows less leaves, but sends up flower stalks in an attempt to make seeds and reproduce. While it can be hard to start parsley from seed, it really does behoove you to soak the seeds in a shallow dish of water overnight before sowing. If you want it the easy way, buy a plant. You can choose from either curled or flat leaf varieties. We also like parsley because it attracts swallowtail butterflies, especially black swallowtails and anise swallowtails. If you're not keen on sharing with the butterflies, keep your pot inside on the windowsill. We usually try to grow parsley in two different places in the yard, hoping the butterflies will all choose the same spot and leave the other one for us. 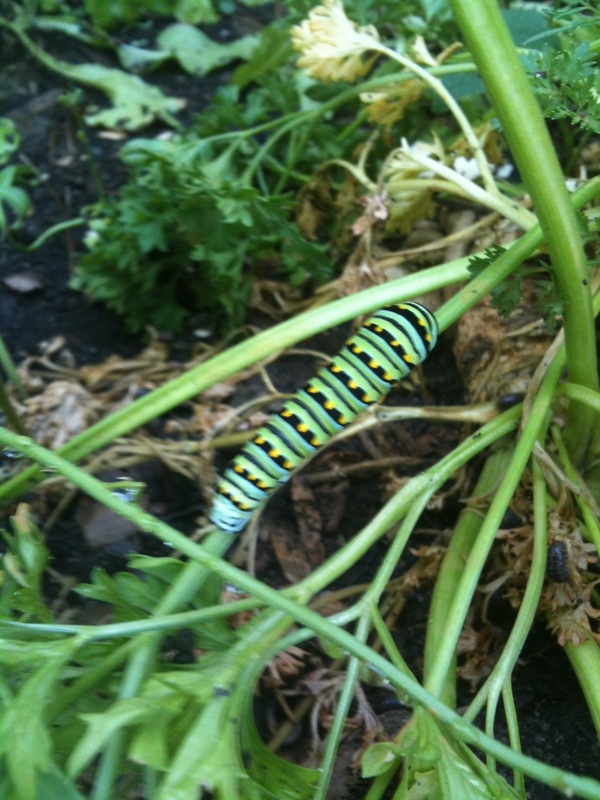 If we have to make the choice, we'll sacrifice the parsley to the butterflies! If you haven't tried parsley recently, now is a good time! Enjoy your herbs, and enjoy eating them! 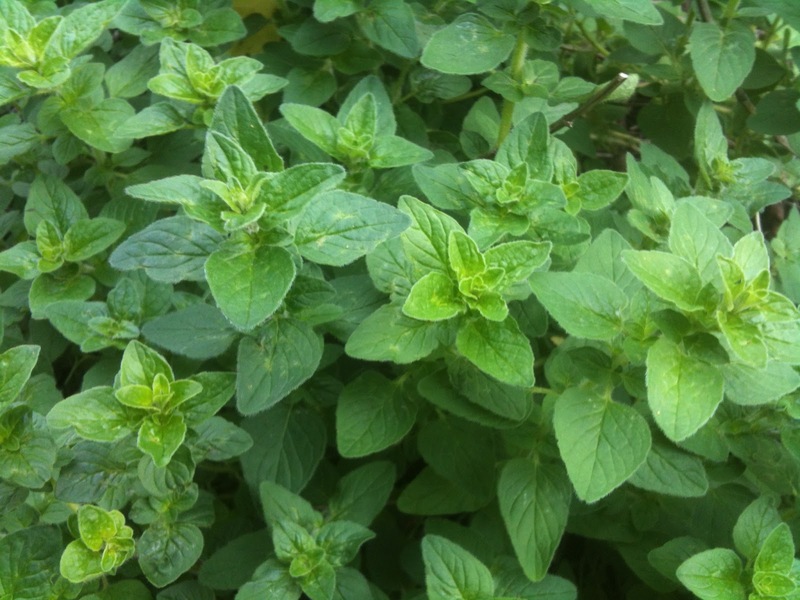 Oregano- how do I love thee? Let me count the ways...you are easy to grow, you smell heavenly, you don’t mind being mowed over, oh yeah... you taste wonderful!!! There are a lot of reasons to love Oregano, but the simplest one is yours! If you’re looking for an easy to grow herb, oregano may be just the thing. While it does belong to the mint family, oregano is probably the best behaved one of the bunch. While it does spread on its own, much of it’s growth can be controlled by two easy things: 1-cutting off any flowers that form before they set seeds, and 2- digging up the edges every year of two and sharing with your friends. I’ve never known Oregano to break concrete or jump fences like other members of the mint family, but if you’re worried- don’t be. It can be quite content growing in a medium sized pot on your porch. Use your Oregano to season a variety of dishes including: lamb, meatloaf, ravioli, chicken, or sausage. It is also at home with shellfish, or mixed into your favorite stuffing recipe. Let’s not forget anything Italian...sauces for spaghetti, Alfredo, pizza toppings... are all good candidates for Oregano. It marries deliciously with anything tomato, and can be just the thing to liven up your omelet. My husband has even been known to crush some dried Oregano into his mashed potatoes. Oregano can be used fresh or dried, just be sure to hose off the dirt (or any bugs) before you eat the fresh! Super simple to dry, oregano only needs to be cut, washed, and gathered into bunches fastened with twine or a rubber band, and then hung upside down out of direct sunlight to cure. After about 2 weeks (longer in humid areas,) simply roll out a paper towel, and place the oregano on top. Then grasping the bunch (or individual stalk) near the rubber band, strip the leaves onto the paper towel with your fingers. Store in a clean glass jar in your kitchen cabinet for up to a year. For the most potent Oregano for drying, with the most volatile oils, pick it after the dew dries in the morning, but before noon. Fear not, Oregano doesn’t care when you pick it to eat it fresh, just pick it! It will reward you with 2 new shoots from your cut, thus giving you even more Oregano to love. If you’re feeling inspired--- go plant some Oregano and begin enjoying it. It needs well-drained soil, it is a Mediterranean herb, so once established it can take the heat, but it doesn’t like soggy feet. I have some in our garden, and whenever it needs divided and I don’t have a waiting list of friends, I’ll just transplant some to the front yard, under the maple tree. It is so hardy that it fights the tree for nutrients, and they’re both doing fine. Then, if it gets unruly, I just mow it! Stay tuned for more fun with herbs! To make sure you don’t miss a single herb this summer- follow our blog!